Your love life is your business, and while your Tinder profile might not be a secret, you likely don't want it publicly broadcast. But as it turns out, anyone can see your Tinder profile for just $5. Anyone. 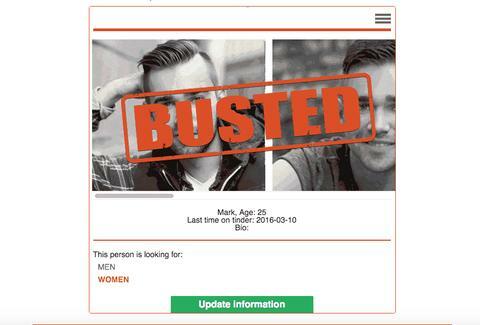 For $5, the website Swipe Buster allows anyone to search for any Tinder account by grabbing data from Tinder's API, or programing interface, which holds all Tinder's user data. All Swipe Buster needs is the user's name, age, gender, location, and of course, your $5. Once you've searched someone and Swipe Buster finds a match, you'll be able to see his/her photos, last log in, and orientation. Each $4.99 purchase gives you three searches; for $9.99 you get 10 searches; or for $29.99 you get 50 searches. According to Vanity Fair, the service absolutely works and is designed mainly as a way to catch cheaters, which it should do really well. Somewhere, Joey Greco is smiling. And even if you're not using Tinder to cheat, the idea that all this information is public is pretty disconcerting. Seriously, there's just no privacy anymore. Kara King is a News Writer at Thrillist and is now even more afraid of Tinder. Send news tips to news@thrillist.com and follow her at @karatillie.